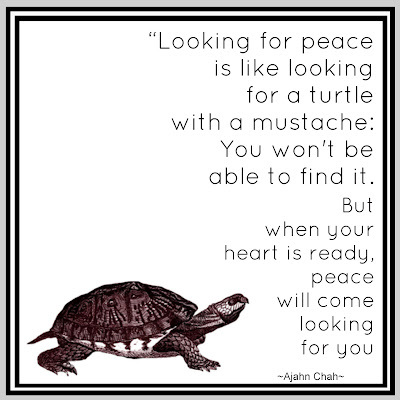 This has been a rough week for our Timmy the Turtle - aka the Hubby/Leigh's Dad - Tim. He had surgery on Tuesday in what we were told should be about a 3 hour surgery - it ended up taking almost 7 due to complications. But the good news is that he should be released on Saturday if all his labs come back okay. So here's a little story about him and how he got his nickname "Timmy the Turtle" (you all know he's going to kill me for this - right?) 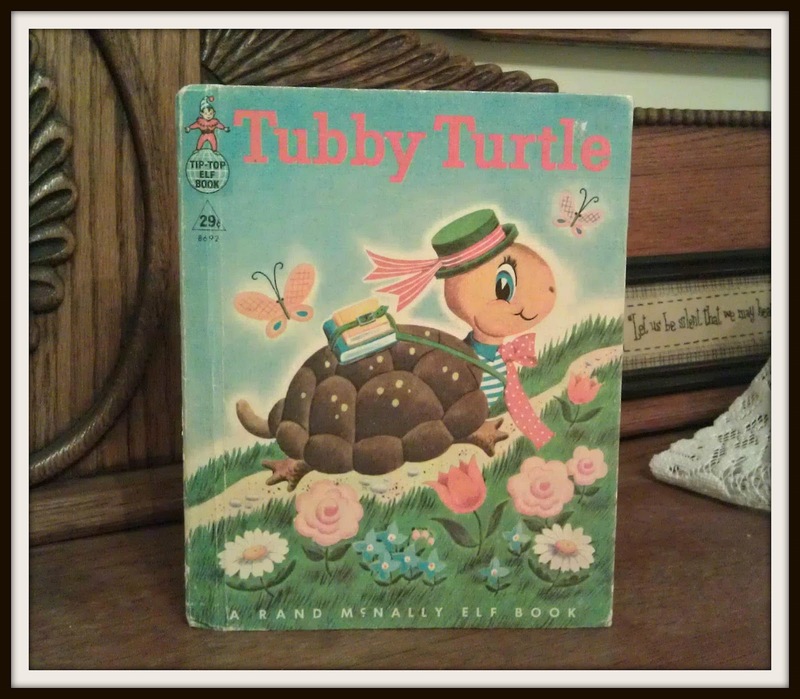 In elementary school, back before the internet (yes children, there was a time when computers didn't rule our world), in the 60's when he was in elementary school in Snyder, Texas, he won a contest and was awarded the iconic children's book "Tubby the Turtle" by his teacher. Of course, if that book were written today, the world would be up in arms about the title, but back in the 60's we were a little more thick skinned. Most of us raised in the 60's probably remember this book. 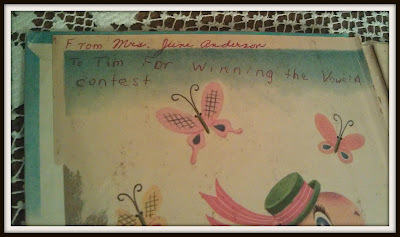 Here's a note from his teacher and I think that he wrote in the part that says "For Winning the Vowel Contest". Isn't that sweet? I would ask him but right now he is sleeping in his hospital bed and trying to wake up the entire floor with his snoring. Love you Babe! be known as "Timmy the Turtle". Truth is, she already called him Timmy and it really stuck around after he got this little book (that he still has) and fell in love with turtles. He has a whole little collection of turtles in his office and a cute little stuffed one in his nightstand. So here's to you Babe and your love of Turtles! 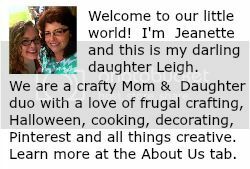 I made this little post it up using Picmonkey (I'm seriously going to have to start asking them for a little kick back for all the times I promote their product!). I know this it technically a tortoise, but it is almost the same thing? Isn't it? I don't have the time (really the inclination to Google it right now). Doesn't every Turtle need a crocheted Turtle Cozy? Of course they do! I wanna play in the rain, please Mom! And my absolute favorite - Ninja Turtle! Every time I see a turtle I think of my sweet husband and they always make me smile - Turtles and Tim! Hope you all have a wonderful weekend and are able to spend it with those you love! I love the Ninja Turtle, I hope your hubby is doing well. We will be sending many prayers and wishes for a speedy recovery. Thanks Karri - he should be out tomorrow! Things like this just make you realize how blessed we are and how wonderful our life is. Prayer is a powerful thing and we appreciate your prayers and kind thoughts. The turtle with the crocheted cozy made me smile but I think the Ninja turtle was the best too. Hope the Hubby is improving. He is recovering, but very slowly. Hoping he will be better soon! Thanks for asking Carla!